2016 really continues to be a very good year for CNN Philippines. For our SONA coverage preference poll released on July 24, the local CNN station ranked as the top choice among our readers, earning a share of 17.37% or a total of 4,367 votes. The network, which during President Aquino's final SONA in 2015 finished in fifth place, also received rave reviews from our readers. One of them concluded: "I am impressed with CNN Philippines. Claire Celdran really knows how to lead a coverage. I am also impressed with Karen Jimeno. She is really good at these explainers." 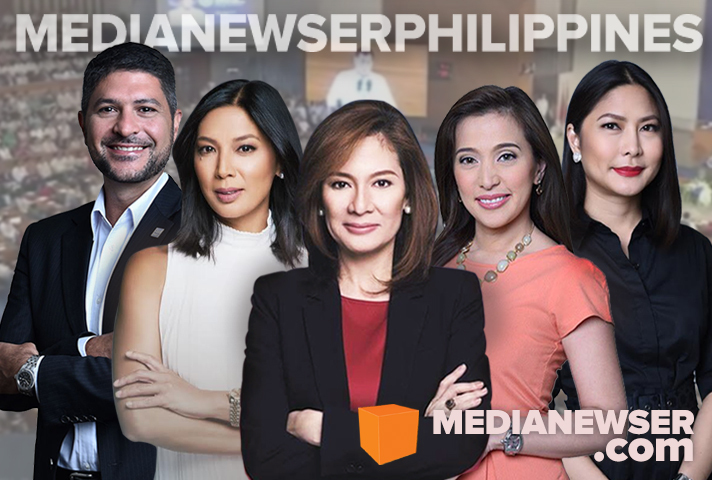 Another one, by the name Lito De Guzman, noted that the network performed better than usual, writing: "For me the highlight of their coverage was the discussion amongst the panel composed of Karen Jimeno, Pinky Webb, James Deakin (who I think is quite a decent anchor) and Nicole Curato. I still have apprehensions though about Gilbert Remulla. I thought his performance was very lacking as compared to Manolo Quezon of ANC. Also commendable is the addition of Claire Celdran. She was very in command and very good as an anchor. I hope to see more of her in succeeding coverages." ANC, meanwhile, ranked second overall with 14.92% or a total of 3,751 votes — up from its third place finish during last year's SONA — followed by TV5 with 14.24% or a total of 3,581 votes. And just like last year's SONA, ANC daytime anchors Nancy Irlanda and Christian Esguerra, who were both reporting live from the Batasang Pambansa, were once again hailed as the tandem to beat during the action-packed coverage. "In terms of interview at the Batasan, it's Nancy and Christian who are owning it. They are really prepared. Congrats ANC!" wrote by a certain Jes. 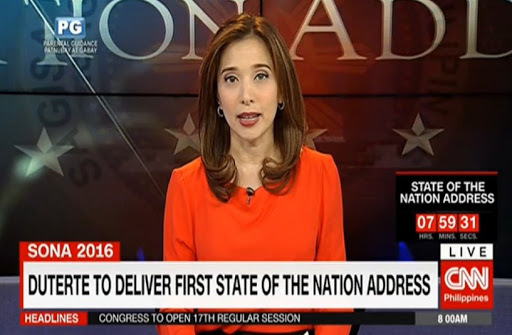 Other anchors who were highly commended during the coverage were Cathy Yang, who was one again praised for her performance, the tandem of Lynda Jumilla and Alvin Elchico on ABS-CBN, and Aksyon Sa Umaga anchor Cheryl Cosim, who led TV5's coverage. Rounding out our poll were ABS-CBN and GMA-7, which were virtually tied, and state-owned PTV4 and UNTV Life. As far as the losers go, a commenter by the name catgotmytongue wrote that the coverage of President Duterte's first State of the Nation Address was the final nail in the coffin of GMA News TV. "What a shame for a strong brand like GMA News to be the namesake of that channel whose identity crisis worsens day by day. Why not repackage it as the Kapuso Channel instead? Just remove 'News TV' in the name and everything's going to be fine. Sa lagay ngayon, mas lalong napapahiya ang GMA News. Isang major, major news event and one news TV of the second biggest network in the country couldn't deliver one decent coverage?" Others such as Ted Failon, who was replaced by Alvin Elchico at the last minute, and Erwin Tulfo, got a lukewarm reception, with some of our readers questioning their objectivity. Our poll ran from July 24 to July 25 and accumulated a total of 25,147 votes. Feel free to share your thoughts on the results of this poll by posting your comments below or on our Facebook page. You can also tweet us @medianewserphil.